Unless you’ve been hanging out with Matt Damon on the planet Mars, you're likely aware that the months of November through January are the heart of the holiday season! Selling your home during this magical time of year may initially seem like more trouble than it's worth. 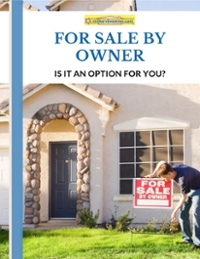 However, by listing your home for sale during the holidays, you could actually gain a competitive edge. With remarkably less inventory during the holiday months, your home may be the visions of sugar plums a serious buyer has been dreaming of! As you deck the halls and prepare to show your property, here are seven “do’s and don’ts” to keep in mind. 1) DON'T plan to make unique holiday recipes when your house is up for show. Sure, cooking up Aunt Martha’s cabbage rolls may be a favorite tradition, but the lingering sulfur scent may not make a good impression. DO have pleasing scents around the house with aromatic diffusers or tart warmers. Fill the kitchen with fragrance with a teaspoon or two of vanilla extract in a coffee cup placed in a warm oven, or simmer nutmeg, cinnamon, and orange slices on the stovetop. 2) DON'T plan on buying a real Christmas tree this season. Tending to fallen needles and keeping it properly watered are two more hassles you most likely do not need on your already lengthy “to do” list. DO plan on setting up an artificial tree. The welcome glow of a Christmas tree may appeal to a potential buyer with the cozy comforts of home. Perhaps elegantly wrap a few empty boxes to stage under the tree in lieu of valuable gifts. Having a tree set up in a room may also highlight the versatility of the living space. 3) DON'T fill every nook and cranny of your home with Grandma’s crocheted holiday decorations or other festive bric-a-brac. Remember, less is more. A buyer needs to be able to picture their furnishings in your home. DO consider decorating the front door, fireplace mantle, and dining room table with similar colors and style. By repeating patterns of similar décor, you may create a sense of continuity throughout the home. 4) DON'T add large inflated whimsical yard art or epic Griswold-caliber strings of lights. No good can come from a web of cords or overloaded outlets! Plus, with other holiday expenses, there’s no need for your electric bill to spike. DO update the front porch lighting for a lasting glow beyond the holiday season. Around the entry, consider tasteful lighted garland or the subtle shine of a net of white lights. 5) DON'T leave a mop and bucket visible or bevvy of cleaning supplies out and about. If your home happens to include children or pets, you’ll most likely need to make a clean sweep before a showing. When every room has returned to tidy, neatly store housekeeping items away. DO consider having handy rags and cleaning supplies tucked in a bucket or tote for ease of household touch ups. Also, initiating a family “no-shoes in the house” policy may help prevent tracking in debris. Shoes could be stowed in a crate in the coat closet or gathered in a bin under a hallway bench. 6) DON'T fill a closet or cupboard with last-minute stashed items. Every facet of the house will need to be “show ready” for a potential buyer walking through. Consider organizing and somewhat emptying closets and cupboards to show the depth of the storage capability. DO have a tote or basket handy as a collection point for loose items and clutter when preparing your house for a showing. Then, carry this container out to your vehicle. This tactic may be especially helpful if an unexpected home tour comes up while in the middle of wrapping gifts! 7) DON'T pepper your listing with odd photos of the bathroom or vague descriptions of your neighborhood. Make a good first impression for those who may be house hunting online. DO take high quality photos of your home with flattering views from season to season. 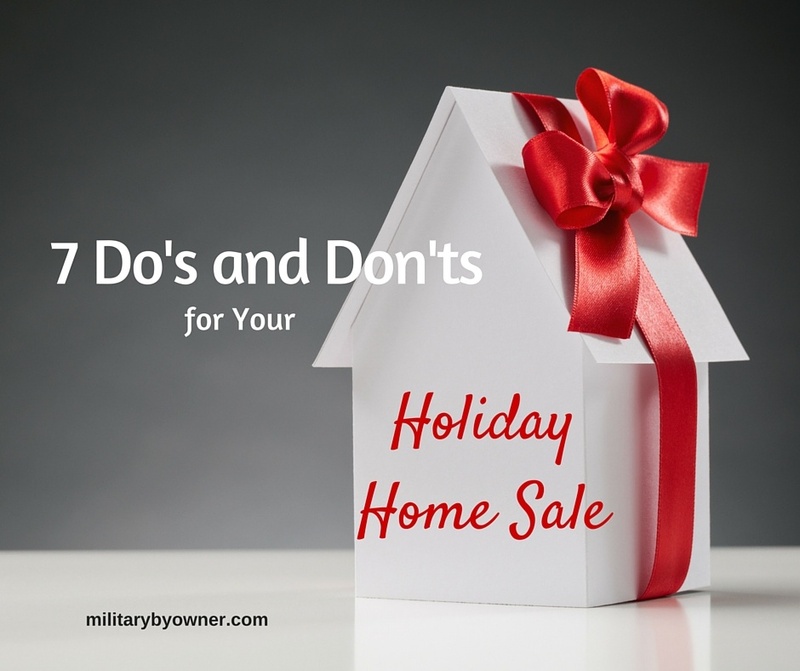 Additionally, by posting a video tour with your MilitaryByOwner ad, if the weather outside is frightful, a potential buyer may find your listing delightful. A person house hunting during the holidays likely has a good reason to do so. Market your home with those motivated buyers in mind, such as a military member with a mid-year PCS, a business employee relocating to the area, or an investor with a tax deadline. If your home is easy to show and priced to sell, it could lead to a holiday season that is merry and bright!